Revelstoke snowmobiling areas closed as Search & Rescue looks for missing Alberta man Travis Allen Brown. Dec. 7, 2015 5:00 a.m.
Update Tuesday at 10:45 a.m.
Two helicopters are in the air above popular Revelstoke snowmobiling areas as the search for a missing Alberta man continues Tuesday morning. Members of Revelstoke and Golden Search & Rescue teams were staging from helicopter hangars off Westside Road this morning as they looked for signs of Travis Allen Brown on Boulder Mountain and Frisby Ridge. Brown was reported missing Monday morning after he failed to return home to Drayton Valley, Alberta, from a solo snowmobiling trip to Revelstoke. Boulder Mountain and Frisby Ridge are both closed to snowmobilers during the search. 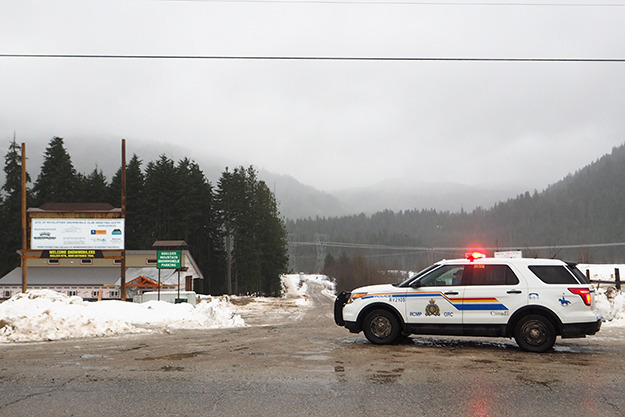 Photo: Revelstoke RCMP guard the entrance to the Boulder Mountain parking lot. Revelstoke Search & Rescue is asking snowmobilers to stay away from Boulder Mountain and Frisby Ridge as the search for a missing Alberta man extends into a second day. Travis Allen Brown, 42, was reported missing Monday morning after he failed to return from a solo snowmobiling trip in Revelstoke on the weekend. Police say he left his home in Drayton Valley, Alberta, early Saturday morning and called his family at 10:30 a.m. that day to let them know he was heading up the mountain by himself. His family tried calling him Saturday at 3:30 p.m., but the call went straight to voicemail. On Sunday, his truck was found in the Boulder Mountain parking lot. Brown was reported missing when the truck was still in the parking lot Monday morning and police were able to contact his family and confirm he hadn’t returned home. Search & Rescue conducted a search of the area on Monday and said they will be continuing their efforts on Tuesday. The organization is planning flights over Boulder and Frisby Tuesday morning using two helicopters outfitted with special transceivers designed to detect RECCO tags, Giles Shearing, a manager with SAR, said in an e-mail. Flight time is weather dependent, he said, adding that the Revelstoke Snowmobile Club agreed to close the areas during the search. Brown is described as a 42-year-old white male, 185 centimetres tall, weighing 77 kilograms, with blond hair and brown eyes. He was believed to be wearing a bright green Helly Hansen snowmobile outfit with a green leaf pattern on the jacket. He would have been wearing a motocross-style helmet, with green camo goggles and riding a red and white 2014 Polaris RMK. Saturday, when he went missing, was a stormy day. The avalanche hazard for the North Columbia region, where Boulder Mountain and Frisby Ridge are located, was rated considerable at all elevations that day.